Margaret brushed the hair from her eyes in front of a large vanity mirror. Silently she rehearsed her speech. She was a bit fidgety in spite of the fact that she had been the spokesperson for the oil and gas consortium for over six years now. This was the first time however, that the entire Washington D.C. crowd would be present. Senators and congressmen, industry leaders including several Arab princes even several representatives from the Russian oil conglomerate Lukoil. She was in the midst of the oil boys. The old oil boys club. It’s okay she thought to herself as she applied a fresh coat of lip gloss. She was remarkably attractive and she knew it. She had relied on her looks before to smooth things out with the naysayers. Just tell them what they want to hear and everyone will applaud. It was all about the money anyway. Make it sound environmentally safe and emphasize the profit. Worked every time and if there was any doubt simply grease a few palms. When had the Environmental Protection Agency ever stepped in any way? It was the same old routine. The agency might balk, some phone calls would be made, then business as usual. Ah the beauty of capitalism in the good old U.S.A.
She straightened her drink on the antique foyer table. The wood was reddish and quite old. Probably mahogany she remarked to herself, this place spares no expense. She looked in the mirror again and marveled at the seascape hanging on the wall behind her in the wide hallway. It captured her gaze for a moment and took her imagination away. 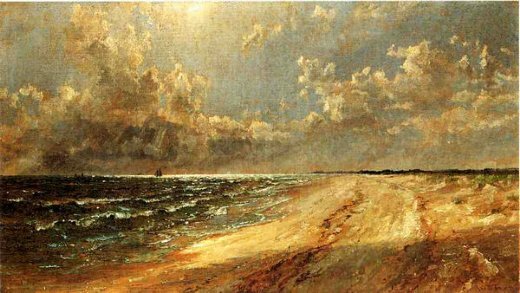 The picture showed a wide beach on the one side that stretched as far as the eye could see, the other side was the ocean, with a dappling of clouds on the distant horizon. She took a large swallow of the bourbon. Quite unladylike but it was just her in the hallway. Turning she walked up to the painting. It was a Jasper Cropsey. Probably worth a beamer at least. Back to the mirror, it was almost presentation time. She was waiting to hear her cue with a final glance at her baby blues. Wait a second! What was that? She had caught a flash in the corner of her eye. There it was again. She looked closely into the mirror which perfectly reflected the painting behind her. Right there on the distant beach something sparkled like a diamond. Was it the bourbon? Yet she knew it was something more. She turned and looked directly at the picture again. Suddenly it seemed dim and bleak. Billy stood on the beach. It was early in the morning. He felt like he had been walking forever. He stopped for a moment and faced the ocean. He felt for the gem resting on his chest and held it up to the sunlight. It glistened brightly. He saw clouds in the distance. Clouds and blue. Blue eyes? No it couldn’t be. Just sky and forever. He held the gem and wanted to ask it a question. How much further would he have to travel alone?